One of the most hype market segments of the past few years has been Physical Security Information Management (PSIM). The promise of integrating systems which were not designed to be integrated, and presenting system information to users via a single common interface has sparked the interest of many in the industry. However, skepticism abounds about PSIM's adoption. Overwhelmingly integrators are staying far away from PSIM despite the hype. Use is even far below the much maligned video analytic market. This, for a group, who 75% of which are deploying more IP than analog cameras. There were no clear-cut trends as to which integrators did or did not deploy PSIM. Those answering "rarely" were nearly equal across all deployment sizes (1-16, 17-32, 32+). 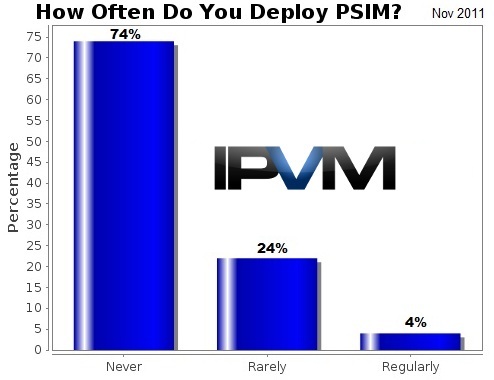 Additionally, those deploying PSIM did not seem to have a clear favorite VMS. Respondents cited mulitple platforms as their favorites. The number one most-cited reason for avoiding PSIM was cost. Indeed, this has been the greatest concern of many in the industry, as we've cited in a number of previous reports. PSIM deployments are routinely in the six-figure range, placing them well outside the reach of most customers. Most of the "big" names in the PSIM industry (Proximex, Vidsys, CNL, etc.) do not seem concerned with this, instead focusing on a very small number of high-dollar deployments. "We don't play in that market. I don't think any of our clients could even afford that." "Does not fit in our client's budgets." "Very few opportunities. We have done some large bids, but the PSIM option is rarely taken up because it is too expensive." "We find this is a costly endevour for our customers that may be remedy in a more cost effective way by migrating to an integrated platform." There may be an opportunity for lower-cost PSIM providers to enter the industry and provide much of the functionality of the big names at a fraction of the cost. Recently, we reviewed SureView Systems' Immix, one of these platforms. While it doesn't provide some of the higher-end functions of the better-known PSIM platforms, it does integrate systems which were not built to be integrated, provides mapping and event handling, etc., the bulk of the functions most customers would seek. It will be interesting to see whether providers such as SureView can gain more marketshare for PSIM. The next most common reason our users were not deploying PSIM was the lack of demand. This is also in line with what we have seen. If there are only a handful of a deployments from each PSIM vendor each year, yet there are thousands of security deployments, PSIM likely makes up below 1% of these deployments. "We have not seen the need. There are many issues surrounding PSIMs like: version compatibility with all of the different products; support; long-term survivability since they are mostly VC funded." "While we are aware of the applications and have access to the solutions, we have not found an environment/client to sell it into yet." "Haven't seen too many applications calling for it, yet." Much of PSIM's functionality may be realized by utilizing existing VMS and access control platforms which integrate other systems. The top two systems users wish to integrate are video and access control, with intrusion detection and fire alarm following after. Most users do not need the workflow or procedural functions of PSIM. Most end users have also standardized on a single video or access platform across the organization, which makes PSIM's varied third party integrations a moot point. "The PSIM industry is still immature. Most application challenges can be met by selecting the approriate (non-psim) hardware combinations." "There is no need for PISM if one selects a good VMS"
"Normally VMS or Access Control and Intrusion system will double up as some kind of PSIM Lite." Despite industry analysts and talking heads hawking PSIM as the next big thing for the past few years, multiple integrators answered that they weren't familiar with the term. Others took it to mean integration of VMS and access control via available out of the box integrations. It is obvious that PSIM does not have the market awareness that mainstream security industry media would have us believe. "PSIM is still one of those buzz acronyms that is hard to define, it has differnt meanings for different people." "Why is PSIM such a catch-phrase? Haven't integrators been doing just that for years, integrating?" "This seems more like a marketing term than anything. We have not been introduced to a PSIM system that has been demonstrated to offer value beyond the disparate syetems." "I would just give them Genetec instead." "Many of our newer installations are becoming Genetec Security Center Applications that involve CCTV, access control, license plate recognition, and perimeter security. " This points to a potential future world where high end VMS applications compete with PSIM head to head.